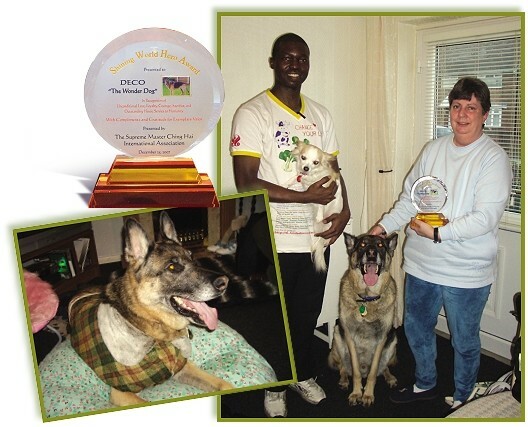 On January 6, Golden Year 5 (2008), representatives of The Supreme Master Ching Hai International Association in London went to Wirral in the north of England,UK, to present the Shining World Hero Award to Deco, a powerful but graceful Alsatian. He saved his caretaker, Jane Sansom, from an intruder who had broken into her house in November 2007. Early one morning, Deco sensed that an intruder was in the house. He acted quickly by jumping up and chasing him out of the house. After ensuring the man was truly gone, Deco returned and lay down calmly at Jane's feet. He stayed there until the police finished their enquiry and then comforted Jane by placing his head gently on her lap. The Association's representatives were warmly received by Jane and her family. Deco seemed to sense what was going to happen and was very excited. As soon as we took out the Happy Doggie Bed, he grabbed it and held it firmly in his powerful jaws, swinging it merrily from side to side before settling down to lie on it. The Happy Doggie Coat suited him well and made him look handsome. When Happy Doggie Snacks were given, Deco shared the treats with his friend, Daisy. It was noticeable that although Deco is big and powerful, he is also very obedient. Even the police commented that he would make a perfect police dog because of his gallant nature, strength and intelligence. Jane said that it had taken a lot of patience, love and care to train Deco when he was first rescued, but she never gave up on him. Now Deco had shown his appreciation in return. Jane was very thrilled and thankful to Supreme Master Ching Hai for the Award as well as the 200 euros and other beautiful gifts. She promised to buy special treats for Deco and Daisy.